We played an early version of Monsteca Corral in February of this year, and we knew then it had a long time left before release. Now it doesn't, as it's due to invade WiiWare in North America on August 16th, with a European release following just days later. Coming to the end of its two-year development cycle with a new subtitle, Monsteca Corral: Monsters vs. Robots follows a herd of monsters named Stompies who must collect energy orbs to feed to an Astro Maggot to escape the planet safely, of course. The trailer explains things more clearly, and the press release below is a stone-cold classic, so if the game lives up to these standards it could be a decent experience. British indie game developer releases first WiiWare™ title Monsteca Corral : Monsters vs. Robots this summer. 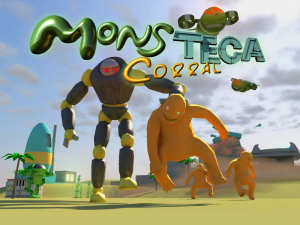 Liverpool, August 10, 2010 – British indie game developer Onteca have revealed the release date of the much anticipated WiiWare™ title, Monsteca Corral: Monsters vs. Robots after almost two years of development. The monster-packed 3D strategy-puzzler will be available on WiiWare™ in North America from August 16 2010 and Europe from August 20 2010 for 500 Wii Points™. Earlier announcements about the game sparked off debates as to whether indie company Onteca could beat the odds and create a user experience to rival Pikmin for WiiWare™. create deviation paths that block off dangerous routes for Stompies. allow Stompies to follow a route. make Stompies split and form sub groups. help Stompies damage the robot environment. make your Stompies jump and shake and fart. rescue your Stompies from Robot Prison. escape on the back of an Astro Maggot. Interactive soundtrack which changes melody based on player activity written by renowned experimental composer Joe McLaughlin (Kling Klang, one of British Indie stars Portishead's favourite bands). I think I'll just stick to pikmin. 500 points only? This could be a great addition to my collection. Oh wow, they really need to hire some kind of graphics artist. That logo is absolutely horrible, and who thought it was a good idea to make the trailer dark and blurry? Maybe the gameplay is good, but that was a really bad trailer. Looks interesting, but I'll wait for the trusty NL review, as usual. Don't really look forward to WiiWare games that are only 500pts. The only one that I think was well received really was that game from Game Arts. N64 graphics for the win baby! The graphics might not be great but if the game has good controls and is fun the 500 points will be worth it. ...yup, that's a bad sign. And that was before I saw the video. Now that I've watched it, I'm convinced that it'll be terrible. I think this looks awesome. And I love the logo too! I also think this looks awesome, I like the visual style alot.It's quite refreshing to me. The gameplay itself doesn't appeal to me so I will not go out of the way to make a purchase. But then again 5 bucks would be a bargain for a decent game. I will need more opinions from NL for this one. I like RTS, but I already have enough of that kind of game. I'm also very fussy regarding this game category. I think it has a kind of cool look to it with the funny movement of the characters anjd the environment. and its was terrible and very repetitive. cant see much improvement to be honest in video. Cant imagine the review is gonna get anything over a 5 for it. The characters remind me of Doshin the Giant and Pikmin. and for just 500pts? Must have! Hope it's as good as it seems. I save 500pts for this. @accc "PSX graphics?" Yeah, maybe. Except if this was on PSX the loading would be 20x longer than any of us remember and everything on the horizon would be completely black. I'm not excited for this, but with Wiiware's limited file size I wouldn't expect anything too ambitious. This game looks fun, I seriously don't care how bad the graphics are. I can't wait to play this! hmm... doesnt look like something id buy but id give it a try.. what ever happen to demos lol at least let you have a good 10 mins on a demo.